Although I’ve drifted away from them in the last few years, I’m a pretty big fan of some of the “blue-collar job” reality shows on US TV, such as “Bering Sea Gold” (which inspired “Beast of the Bering Sea”) and “Flying Wild Alaska”. They go the same way – the first series is actually about the job and what it takes to do it, which is interesting; the second series onwards is soap-opera style bickering with increasingly ludicrous non-events hyped as game-changers. It’s “The Real Truckers Of Rural Alaska”! 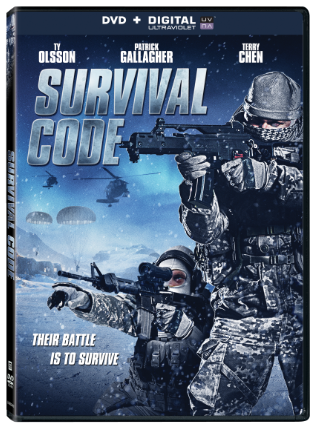 If you’ve seen “Ice Road Truckers”, the first third of this film will be pretty familiar to you. A group of truckers are coming to the end of the ice road season, and are counting their hauls and telling stories when the boss comes in and offers triple pay to anyone who’ll take a load of explosives to a big diamond mine. Right then, you have to immediately suspend your disbelief, and hard. When the temperature rises above a certain level, the roads are shut (because they’re made out of ice). There’s no “triple pay if you make this journey over melting roads” nonsense, the company who sent them out would lose their licence and someone would do some jail time. If truckers are carrying loads of explosives to distant mines, those loads are tied and re-tied and checked over and over again; not just sort of casually placed in the back of a truck. BUT – if you worry about this sort of stuff, the film is already lost to you, and it’s only 15 minutes old. So just relax and go with it. 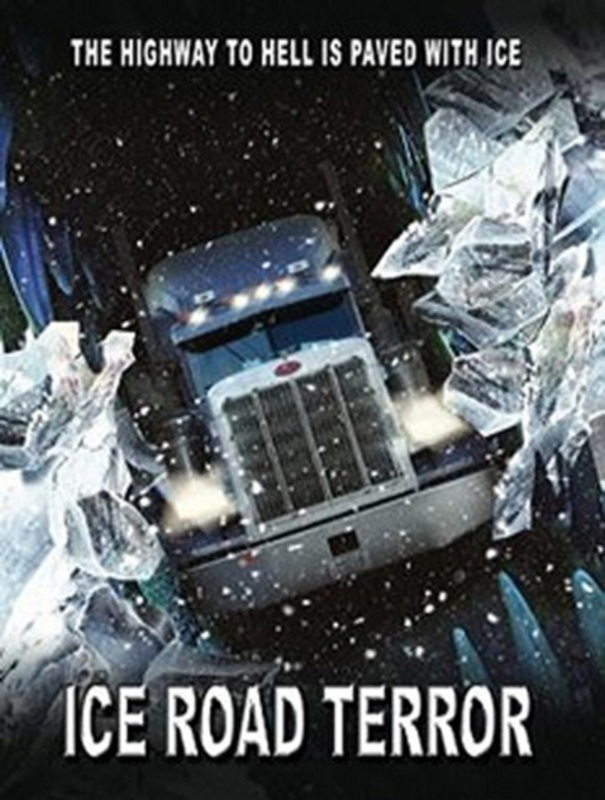 This isn’t too closely based on “Ice Road Truckers”. This is a good thing, as almost everyone on that show is scum, a bunch of backstabbing jerks who are either slave-drivers or whining babies. Also, the majority of the show is people sitting in trucks, which isn’t all that exciting, so they have to do stuff like “here’s the computer graphic of what it would look like if something exciting happened”. But it does make me afraid that SyFy is going to start making films based on other shows like this. “Flying Wild Alaska” has already been covered by the Canadian drama series “Arctic Air” (which is very very similar to the show in a lot of respects); but there’s other options. Perhaps the scumbag diamond dealers could all be killed by a creature that feeds on greed. I personally worry about a film based on “Ancient Aliens” and how it would give the collection of liars and lunatics on that show a boost through association that they don’t need. Fulfilling one of the rules of SyFy Channel movies, the problem comes when we do something we shouldn’t, environmentally. A diamond mine places its dynamite below the aquifer, a big no-no legally speaking. 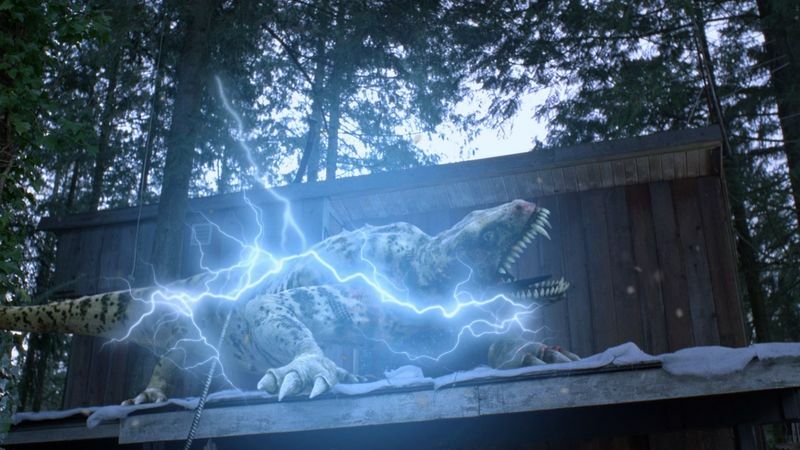 This, of course, disturbs a cave with a prehistoric dinosaur-type creature in it, and Dino just goes to town on the miners, killing them willy-nilly. The only one who survives this is the weasely boss who feeds his workers to the beast. Man, those corporate types! Jack and Neil, two truckers who are friends despite a professional rivalry, agree to take the explosives to the mine, along with giving a lift to Rachel, a scientist who’s been contracted to inspect the mine. 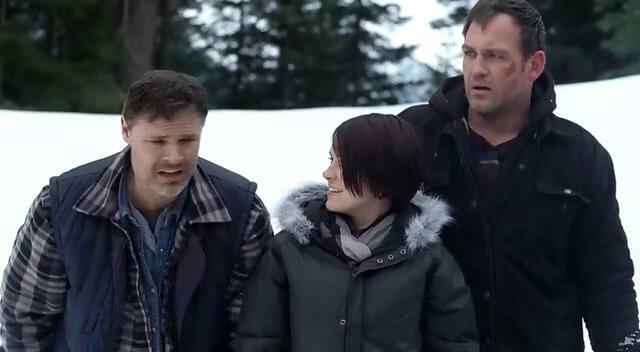 These folks, along with quite a lot of the cast, are genre TV stalwarts – Jack is Ty Olsson, aka Benny from “Supernatural”; Neil is Dylan Neal, from “Blood Ties” and “Arrow”; and Rachel is Brea Grant, from “Heroes”. Also popping up is Michael Hogan, who was so brilliant on “Battlestar Galactica” and you’ll recognise other people too. Where were we? Two trucks full of explosives, two truckers, a scientist, assorted cannon fodder and a dinosaur. Much like every SyFy movie ever, they don’t really have much of a clue what to do with act 2, but that’s where the comparisons end. Olsson and Neal are top-level actors and make two decently believable characters out of what could be gruff, wisecracking truckers, and a relationship develops between Jack and Rachel that actually feels like the sort of relationship that human beings might have, not some scriptwriters idea of how he should be able to pick up women. She encourages him to walk the walk rather than just talk the talk, and he listens rather than just hits on her. Just something as simple as that lifts all the material around it. The special effects are a bit rubbish, and there’s a couple of moments where people seem to teleport as the film is uninterested in showing them getting from point A to point B; but these are small potatoes. For a normal movie, this would probably be pretty bad, but if you’re a SyFy connoisseur then this will be a very pleasant surprise. 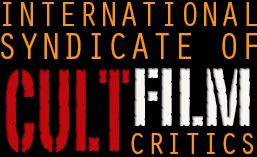 Fast-paced, well-acted, plenty of blood and guts, and absolutely worth a watch. The future is miserable and a bit depressing. I know that (hopefully) long after I die, the world will choke itself because rich people only care about making profit and too many poor people have been tricked into thinking the Kardashians are important people who are worth an instant of your time, but I always hope that more sci-fi will be more like the sort of utopia we deserve, and less like the living hell we’re going to get. 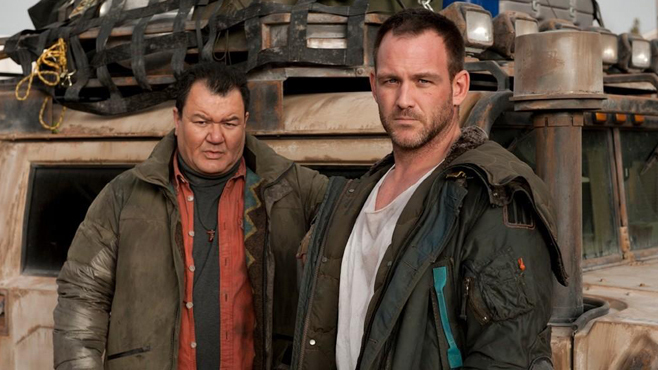 Anyway, Ty Olsson is a great actor, and well worth watching in just about anything. He’s one of the best recurring characters in the history of “Supernatural” and is a decent role away from a decent level of stardom, I think. Luckily for we lovers of things at the bottom end, he’s not got it yet so we get films like this. He’s a former MMA guy who runs a bar as well as being the local customs agent – and we’re immediately introduced to the people who are going to be taking part in this TV series. Sorry, it’s so obvious it’s a pilot for a TV show that I felt bad holding out on the information as long as I did. It’s set somewhere in Northern Canada. When the opening info-dump told us about the melting of the ice-caps, and how “arctic” things were going, my first thought was “hold on, I didn’t think there was any actual land at the North Pole?” but I was just being tricked a little. It’s 2045, and the gold-rush town at the top of the world features a mix of people of all nationalities, trying to find the last reserves of oil and gas anywhere on Earth. You can fill in most of the blanks yourself. It feels a little like SyFy Channel show “Defiance”, just without the aliens – a charismatic lawkeeper, lots of different factions manoeuvring for dominance, weird and wonderful ideas being thrown at the wall to see what sticks. In fact, “Defiance”‘s existence probably sounded the death knell for this show’s potential – there are a lot of reviews of this from when it was first broadcast which sound quite hopeful for it getting picked up to go to series. Sorry, guys! It looks surprisingly good, so clearly some money was spent on it, and it’s several orders of magnitude more interesting than your average SyFy Channel movie. And it would, truth be told, have made a perfectly decent TV series. I just wish that visions of the future had a bit more of the “Star Trek” about them and a bit less of the dystopian – if we don’t all want to die in an increasingly violent rush for the last natural resources on our planet, we need to start working together, for everyone not just the super-rich. And that sense of “is this what we can expect?” hangs over this film like a smog cloud, leaving a bad taste in the mouth despite a decent cast, some okay effects and a plot that could have supported something ongoing.